Chronic deficiencies of yin causing dry cough, dry throat and dry nasal passages. Secondary symptoms may include dizziness, ringing of the ears or palpitation. 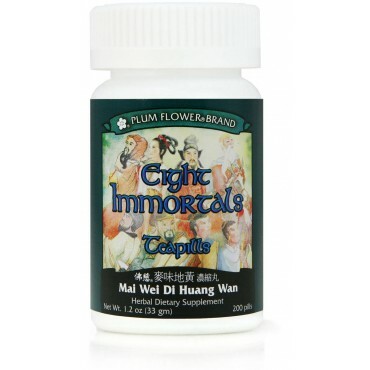 Applicable in chronic dry cough due to tuberculosis, HIV infections, diabetes, smoking and dry deficiency asthma are some of the imbalances satisfied clients have used this product for. Rehmannia glutinosa root-prep, Cornus officinalis fruit, Dioscorea opposita rhizome, Paeonia suffruticosa root-bark, Alisma orientalis rhizome, Poria cocos fungus, Ophiopogon japonicus tuber, Schizandra chinensis fruit, Botanical wax, Talcum. - Shu di huang, Shan zhu yu, Shan yao, Mu dan pi, Ze xie, Fu ling, Mai men dong, Wu wei zi, Botanical wax, Talcum.